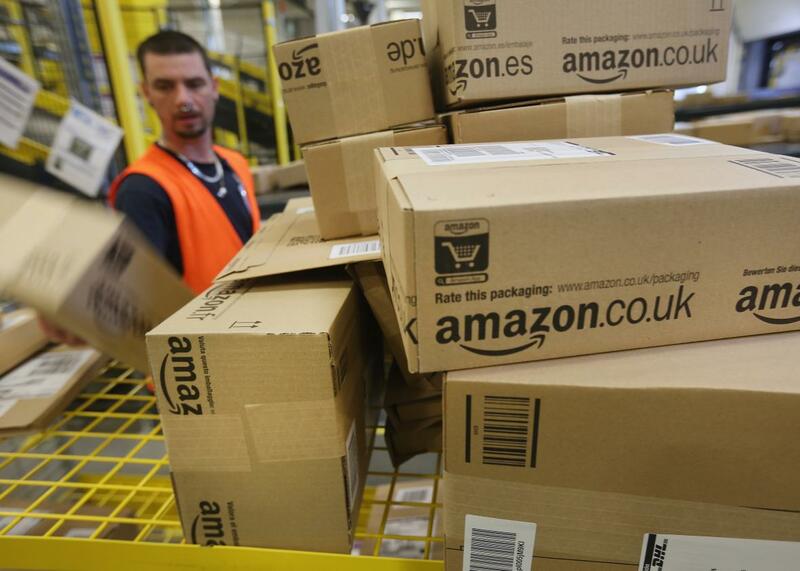 A worker prepares packages for delivery at an Amazon warehouse in Brieselang, Germany, on Sept. 4, 2014. Amazon recently began to offer same-day delivery in select metropolitan areas. This may be good for many customers, but the rollout shows how computerized decision-making can also deliver a strong dose of discrimination. Sensibly, the company began its service in areas where delivery costs would be lowest, by identifying ZIP codes of densely populated places home to many existing Amazon customers with income levels high enough to make frequent purchases of products available for same-day delivery. The company provided a webpage letting customers enter their ZIP code to see if same-day delivery served them. Investigative journalists at Bloomberg used that page to create maps of Amazon’s service area for same-day delivery. Unfairness like that in Amazon’s delivery policy can arise for many reasons, including hidden biases—such as assumptions that populations are distributed uniformly. Algorithm designers likely don’t intend to discriminate, and may not even realize a problem has crept in. A similar question has been asked of Uber, which seems to provide better service to areas inhabited by higher proportions of white people. It is likely there will be more retail and service industry examples of unintentional algorithmic discrimination discovered in the future. In consequence, few stores choose to locate in poor inner-city neighborhoods. Particularly in the context of grocery stores, this phenomenon has been studied extensively, and the term “food desert” has been used to describe urban areas whose residents have no convenient access to fresh food. This location bias is less studied for retail stores overall. As an indicative example, I looked at the 55 Michigan locations of Target, a large comprehensive retail chain. When I sorted every Michigan ZIP code based on whether its average income was in the top half or bottom half statewide, I found that only 16 of the Target stores (29 percent) were in ZIP codes from the lower income group. More than twice as many, 39 stores, were sited in ZIP codes from the more affluent half. Rigidity has to do with both the online retailer’s decision-making processes and with the result. Amazon decides which ZIP codes are in its service area. If a customer lives just across the street from the boundary set by Amazon, she is outside the service area and can do little about it. By contrast, someone who lives in a ZIP code without a Target store can still shop at Target—though it may take longer to get there. Let us a look at a very different example to see how the same points apply broadly. Recently, ProPublica published an excellent analysis of racial discrimination by an algorithm that predicts a criminal’s likelihood of offending again. The algorithm considers dozens of factors and calculates a probability estimate. ProPublica’s analysis found significant systematic racial bias, even though race was not among the specific factors considered. Without the algorithm, a human judge would make a similar estimate, as part of a sentencing or parole decision. The human decision might consider a richer set of factors, such as the criminal’s courtroom demeanor. But we know, from studies in psychology, that human decision-making is replete with bias, even when we try our best to be fair. But any errors that result from bias in human judges’ decisions are likely to be different among judges, and even for different decisions made by the same judge. In the aggregate, there may be racial discrimination due to subconscious bias, but establishing this conclusively is tricky. A U.S. Justice Department study found strong evidence of disparities in sentencing white and black convicts, but could not clearly determine whether race itself was a factor in those decisions. In contrast, the exact same algorithm ProPublica looked at is used in thousands of cases across many states. Its rigidity, and the large volume, ease the job of determining if it discriminates—and can offer ways to efficiently rectify the problem.